The high season for summer mountaineering in Chamonix has started. 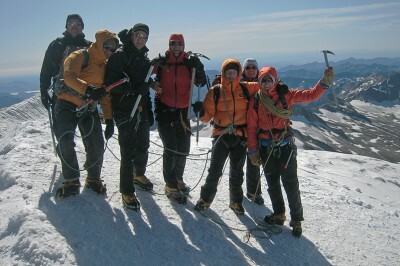 Last week we had 3 groups on a 5-day Mont Blanc course, as well as 2 groups on an alpine climbing course. Before taking off on such an adventurous week, we always discuss everyone’s personal equipment carefully; from boots and socks to sunhats and beanies, from underwear to down jackets. To aid our clients in the pre-arrival shopping process, we would like to supply some information on what to wear on mountaineering courses in the Alps. Having the right clothes significantly increases your comfort and also your chances for success when alpine climbing. Weather conditions and temperatures changes extremely quickly in the Alps summertime. You need to be able to stay dry and maintain the right degree of warmth from morning till the afternoon, without bringing your whole wardrobe in your backpack. Being too cold, too warm, or wet quickly becomes an additional factor of fatigue. Fuffing around with badly adjusted clothing and equipment costs you precious climbing time, and time is safety in the mountains. In the clothing list below we have exemplified many of the described items with products from Norrona. We use their clothing because they simply have the things we like. 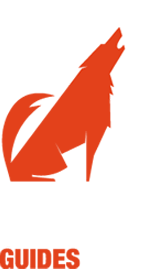 Norrona is a high-end brand who are developing the next generation of outdoor clothing in close relationship with professional mountain guides and sports men. Base layer: Long-sleeve underwear top and long johns made of wool or synthetic materials is best to wear close to the body. Avoid cotton since it tends to get cold and clammy when wet. Depending on temperatures and your type of mountaineering pant, the long johns can be worn underneath or not. However, a long underwear top and one layer of long pants is always worn in order to protect our skin from the snow and the strong sun radiation in the mountains. Even though temperatures are sometimes +10 degree Celsius, we do not go to the high mountains in shorts and t-shirt. Pants: A thin pair of soft shell mountaineering pants, such as the Norrona Svalbard pants, are comfortable with or without a base layer and practical to wear most days. Additionally, bring a light pair of shell pants for rain, snow and wind protection. Instead of baggy gore-tex ski pants, bring a light pair of rain pants that you can pull on without taking off your boots and crampons (really handy when standing in the snow). For example the Falketind pack-light pants. Jackets: As insulation layer, both a thin and a thick fleece is good to have; the choice of the day depends on the temperature. Norrona 29- and Narvik-series provide various thicknesses and have hoods, which can be used as sun and wind protection. Wind stopper fleeces are less convenient since they are heavy and do not breathe as well as a fleece, and you need a wind and waterproof shell jacket anyway. Always bring a thin gore-tex shell jacket or a light rain jacket for rain and wind protection. We recommend the Falketind pack-light or the Bitihorn rain jacket from Norrona. When going as high as Mt Blanc, a light down jacket is also nice to have since is can be very cold with the wind chill. Hats: Sunhat and beanie are both indispensible for long summer days in the mountains. The face also needs to be protected with 30-50 sun cream, and the eyes with sun glasses (preferable category 4). For climbing Mt Blanc, also bring skiing goggles to keep the face warm in case of cold winds. Gloves: You need a thin pair of waterproof gloves, impregnated leather is good. 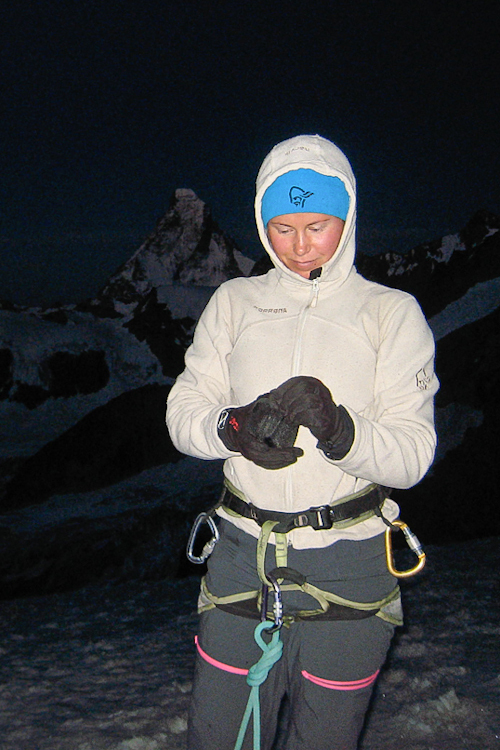 For cold days and high peaks, bring an extra pair of warmer gloves too. Boots: A pair of gaiters to link pants and boots is always good. Even if the snow is not very deep, the gaiters will prevent you from ripping your pants in pieces the first day you are using your brand new, super sharp crampons. The boots you need is a stiff pair of leather boots that you can fit crampons onto. Which boot to buy depends on what type of mountaineering you want to use them for, and if you easily get cold feet or not. For most summer mountaineering we use a light and comfortable boot such as the Scarpa Triolet. It is very nice for walking and works well for all the climbing except for very technical ice routes. It is ideal for our Matterhorn courses. For climbing Mont Blanc, a warmer boot is recommended if you easily get cold feet. La Sportive Nepal EVO and Scarpa Mont Blanc are all round boots that work well for both for summer and winter climbing in the Alps. Scarpa Phantom Guide is an option for those who are concerned about cold feet. It might be good on Mont Blanc, but for all other summer mountaineering in the Alps it is unnecessary warm and heavy. 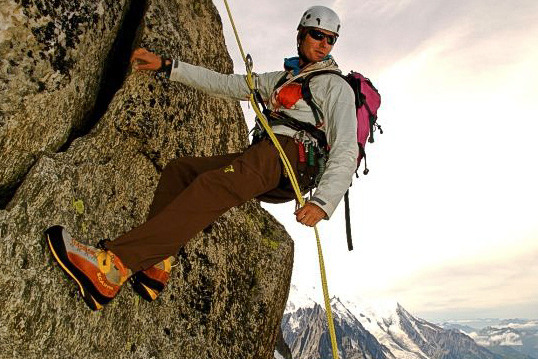 There is a lot to choose from on the market when it comes to alpine climbing boots. You just have to try them out and see what fits your feet best. For a first time mountaineer, renting boots to try out the first week is a good option.